MOSCOW, -- Russia may be leveraging India's anger at French aerospace firm Dassault to kill a $20 billion aircraft deal, after allegations that the company seriously misled New Delhi on pricing its Rafale fighter jets. After three years in limbo, Indian newspaper Business Standard reported on Monday that India's defense ministry now considers the contract "essentially dead." Moscow lost out on the contract in 2012, when India chose Dassault's Rafale fighters over Russia's MiG-35 multi-role aircraft. With tensions between Russia and France high following Paris' decision last year to delay the delivery of two Mistral-class warships over conflict in Ukraine, analysts said that politics may have played a role in the demise of the French aerospace deal. "Obviously, Russia is working to kill the French contract and they are [attacking] from all directions," Ruslan Pukhov, director of the Moscow-based Center for the Analysis of Strategy and Technology, a defense industry think tank, told The Moscow Times by phone on Monday. But Petr Topychkanov, a military expert at the Carnegie Moscow Center, said that although Russia may be influencing India's position, "it does not mean that Russia will automatically get the deal," as the U.S. aerospace industry is also aggressively targeting the Indian market. India's air force is aging, but New Delhi's strategic ambitions in Southeast Asia are rising. With its aging fleet of Soviet-era MiG-21 fighter jets fast approaching retirement, India's defense ministry announced a $10 billion tender for 126 foreign fighter jets in 2007. One of the largest fighter jet tenders in history, India's call drew the attention of some of the world's largest aircraft manufacturers — such as France's Dassault, the U.S. behemoths Boeing and Lockheed Martin, and Russia's RSK MiG. In 2012, India named Dassault the winner of the tender, which called for the localized production of all but 18 of the 126 aircraft under the arm of India's largest aerospace firm, Hindustan Aeronautics Limited (HAL). Rafales were chosen in part because they were thought to be cheaper to produce and operate than other options. But Dassault based its bid on incomplete pricing information that did not take into account the cost of outfitting and operating the fighters over their entire operational lifetime. Over the course of three years of negotiations, the value of the contract has since swollen to $20 billion, and is now threatened by allegations surfacing in the Indian press that Dassault intentionally misled the defense ministry over the price. "[Dassault] has not demonstrated any progress, and for India this deal was extremely important for the innovation of their aerospace industry — they cannot wait for years to get new warplanes." Neither Dassault nor the Indian defense ministry could be reached for contact by The Moscow Times. Russia's RSK MiG, designer of some of the country's most famous fighter jets, was one of the major aerospace firms to bid for India's $10 billion tender back in 2007. At the time, it proposed that India purchase its MiG-35 multi-role fighter, an aircraft that was and still is stuck in development. India's military leaders expressed little interest in the deal, though, as their tender required a fighter that had already proven itself and was in serial production. Still, India's need for capable fighters in the near-term may open a window of opportunity to sell them Russia's long-produced Sukhoi Su-30. According to Pukhov, "the longer they continue to postpone their decision on [Rafale], the more they need something to bridge the gap. That something is more batches of the Su-30." India is familiar with the aircraft, having over 200 Su-30s already in service. New Delhi so far appears to be responding favorably to Russian pressures to buy the Su-30. In December, Manohar Parrikar, India's defense minister, said that negotiations with Dassault had run into unspecified complications, and that "[Russia's] Sukhoi Su-30MKI is an adequate aircraft for meeting the air force's needs." Russia's Irkut Corporation, a subsidiary of the United Aircraft Corporation and the manufacturer of Sukhoi's Su-30, announced its intention to present a prospective modernization program for India's Su-30 fleet at the opening of the Aero India 2015 air show on Wednesday, the TASS news agency reported Monday. A Russia-India joint project to develop a next-generation fighter aircraft, the Sukhoi PAK FA, may complicate Russia's bid. "The fact is that India is no longer willing to give all of the expensive arms contracts to one single supplier," Topychkanov said. Because of its engagement on the PAK FA project, India is more likely to favor bids for replacing the Dassault contract from U.S. Aerospace giants Boeing and Lockheed Martin — who offered up their F/A-18 Super Hornet and F-16 Falcon, respectively. The United States also last year overtook Russia as India's number one arms supplier, and U.S. President Barack Obama and Indian Prime Minister Narendra Modi recently negotiated a sweeping military-industrial cooperation agreement that is due to be signed later this year — a development that Carnegie's Topychkanov says heralds even greater arms trade between India and the United States. Pukhov noted, though, that India may eventually use the fighter jets to counter regional adversary Pakistan — a U.S. ally. If India were to attack Pakistan with U.S. jets, there is the possibility that Washington might refuse to supply spare parts, making the United States unlikely to receive the contract, he said. 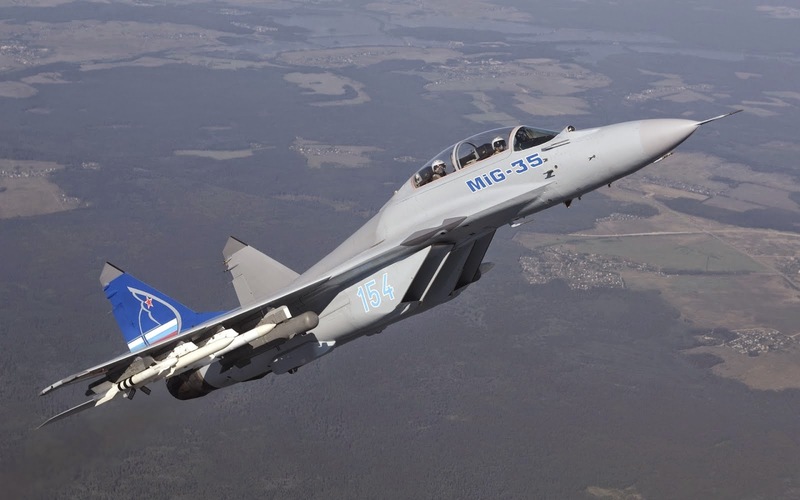 Mikoyan MiG-35D 'Fulcrum F' Multi-Role Fighter Aircraft.